BGMDT K9 provided highly trained canine handler security teams for a gamut of asset protection operations. Working in the Canadian Maritimes for over 30 years, we had a large client base. Concerts, auto dealerships, shipping and manufacturing all find the "dog teams" to be more than effective as a deterrent and detector of criminal activity. Staff for the teams found the training rigorous, and work rewarding. 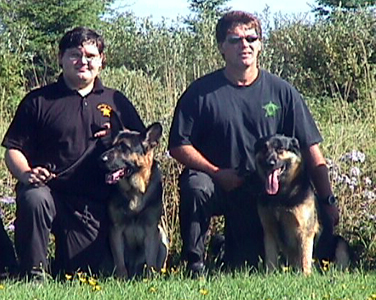 All handlers were licensed with the New Brunswick Justice Department and the Nova Scotia Police Commission. Trained by experienced supervisors, the primary prerequisite was a love of dogs. Working primarily in night operations, little movement escapes the keen senses of the dog. Able to smell hidden criminals or potential vandals, and more than able to protect their security guard "masters" made the team a respected addition to alarms and lights.